Art builds bring people together and create stronger coalitions. 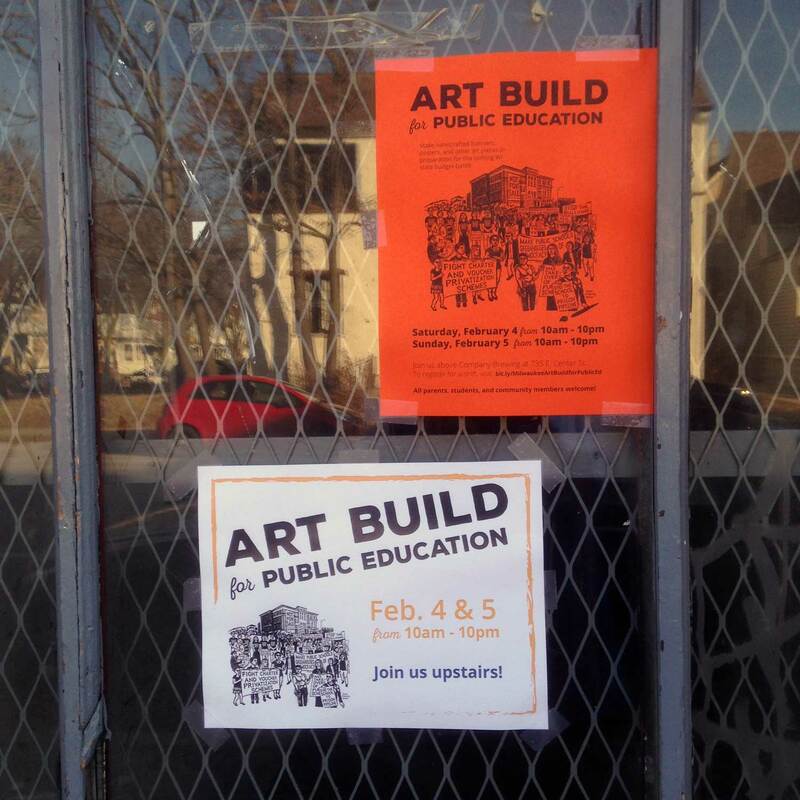 A few weeks ago over 150 people – artists, public school teachers, union organizers, activists, allies, and community members came together for a three-day art build in Milwaukee, Wisconsin to work on an art build that advocated for public education justice at the K-12 level at a time of budget cuts and privatization schemes. 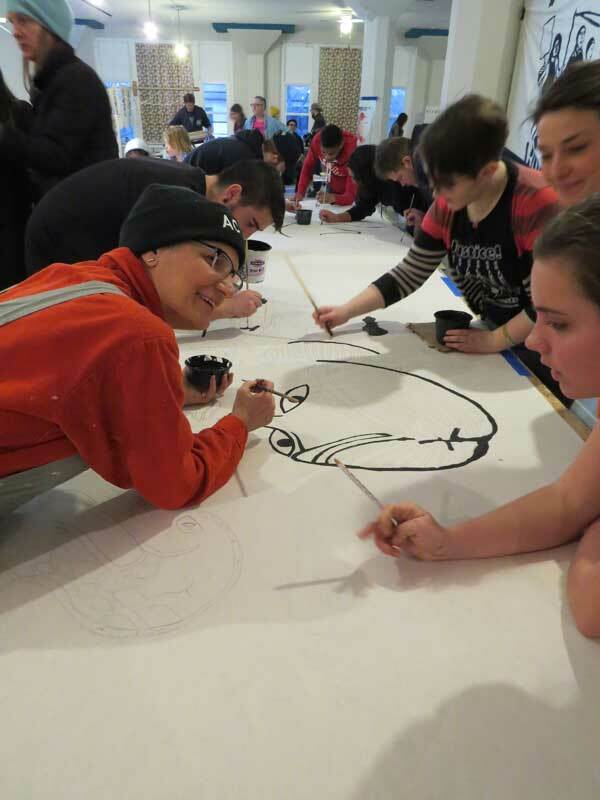 The art build was organized by MTEA (Milwaukee Teachers’ Education Association) which is the union for K-12 teachers in the Milwaukee Public Schools district (MPS.) MTEA is a force. 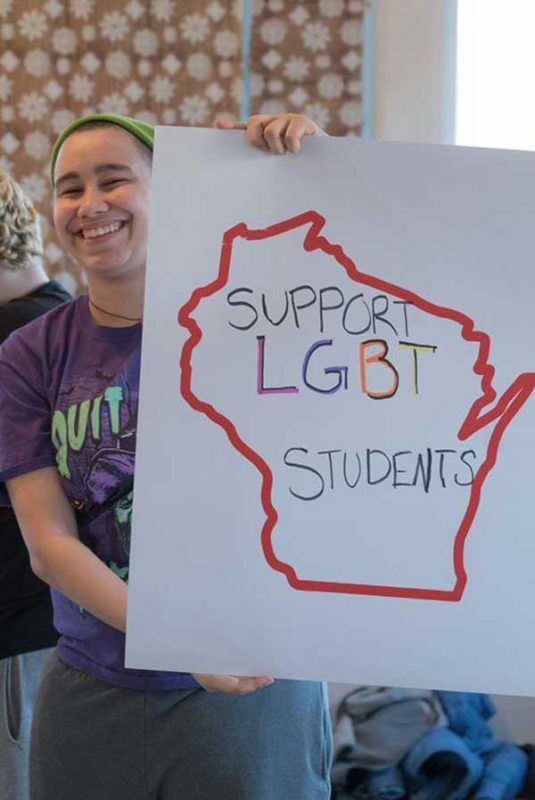 They are the largest union local in the state of Wisconsin, representing more than 4,000 teachers, educational assistants, and other education professionals in the Milwaukee Public Schools. 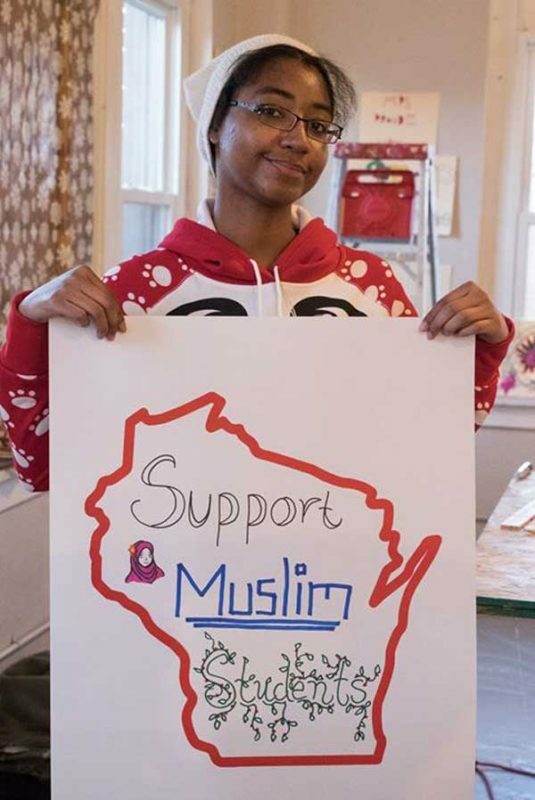 MTEA does this vital work in a state where Republicans control all three branches of government and where an extreme right-wing Governor (Scott Walker) has passed Right to Work and ACT 10 that dismantled collective bargaining rights for public employees. 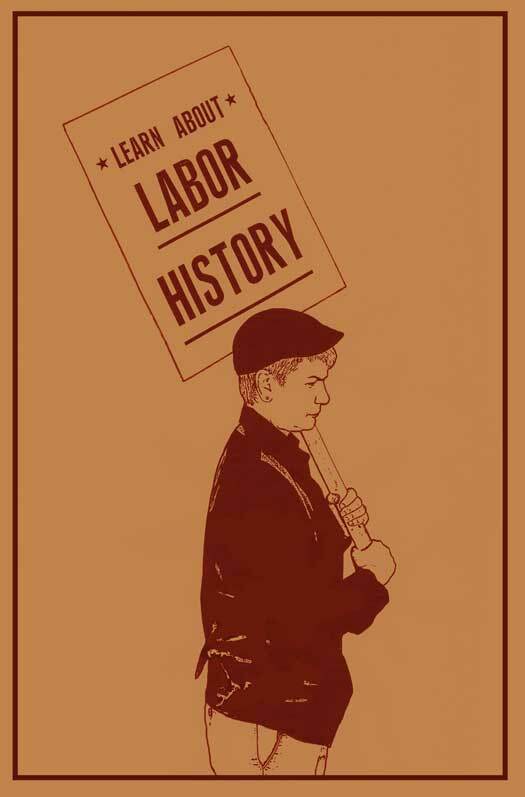 Despite these attacks MTEA persists and is one of the great examples of the power of organized labor. 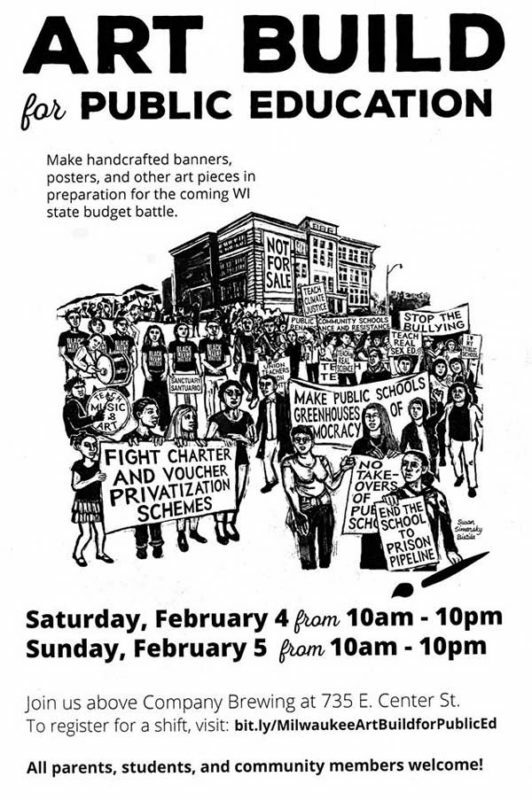 In late 2016 Joe Brusky of MTEA (and also the Overpass Light Brigade) proposed to myself, Susan Simensky Bietila, and John Fleissner the idea of a three-day art build for public education. Joe had photographed the art build that we had done the year prior in Milwaukee when David Solnit traveled out from the Bay Area and took part in an art build where three key local groups – Voces de la Frontera, the Coalition for Justice, and Citizens Acting for Rail Safety all worked in the same space. For this art build the focus was on creating art that MTEA could use in a variety of organizing strategies for promoting the positive work that happens at MPS, preparing for Walker’s next State budget, and for raising awareness of the many privatization schemes in Wisconsin where public school funds are shifted to charter schools. 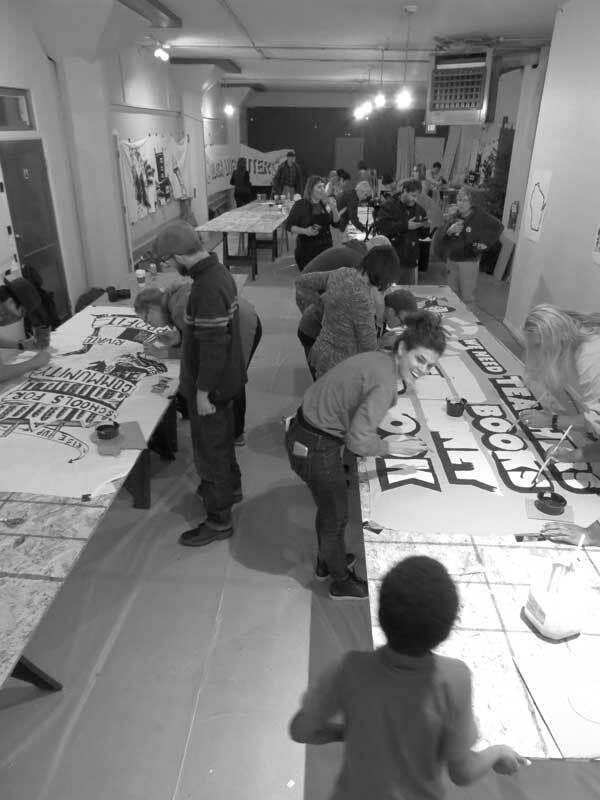 A month prior to the art build Joe Brusky led the core organizing group for the art build (the artists and MPS art teachers) to discuss what key issues should be addressed and what type of art should be made. The decision was to create images and slogans to be used in support of closing the MPS funding gap that currently puts MPS students thousands of dollars behind their suburban counterparts in per pupil funding, a robust expansion of the public community schools model that has already brought seven schools to Milwaukee, racial and educational justice for our students and our communities, and democratically controlled and accountable school boards elected by the people of Milwaukee. For the next three weeks artists designed images and posted them on a private social media page for critique. 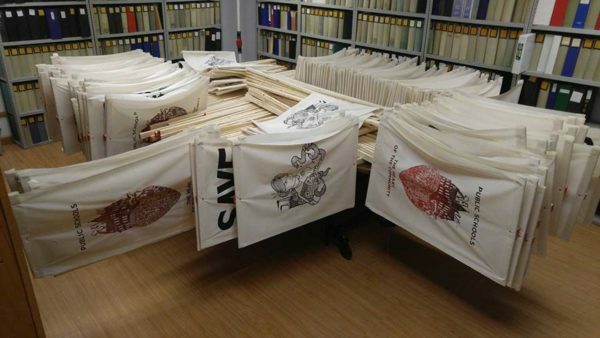 The final step was for the organizing team to decide on the final images and for the materials to be ordered ahead of time. 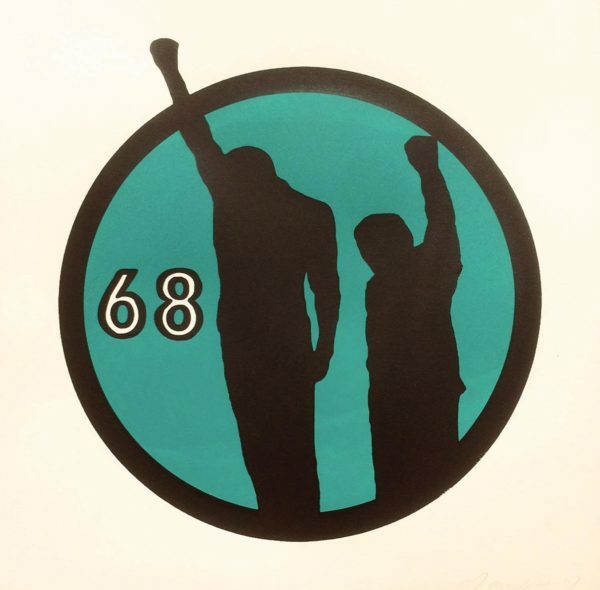 During this step it was vital for collaborations to happen and for artists to recognize that they were designing for a movement and ultimately the movement (MTEA) was the one to decide which images and slogans were most appropriate for their tactics. 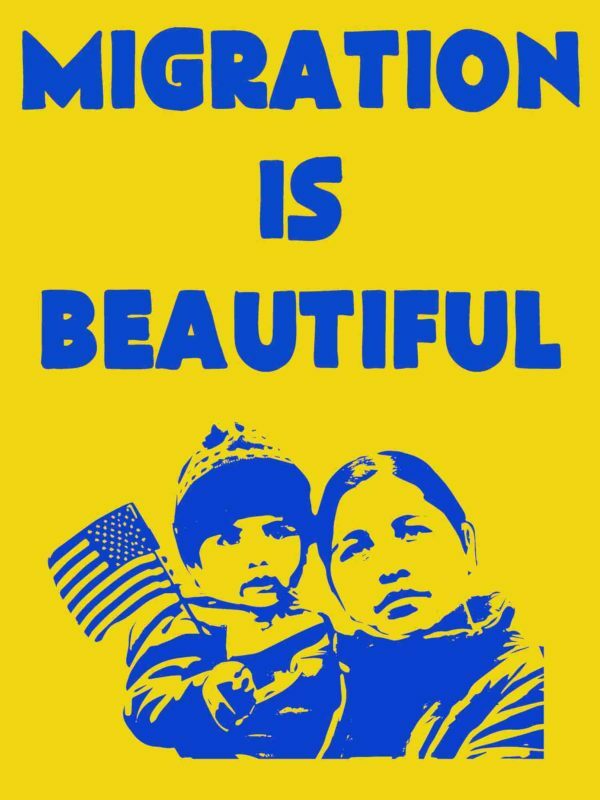 MTEA narrowed the slogans down to these, although artists were given leeway to propose new slogans that might work better. 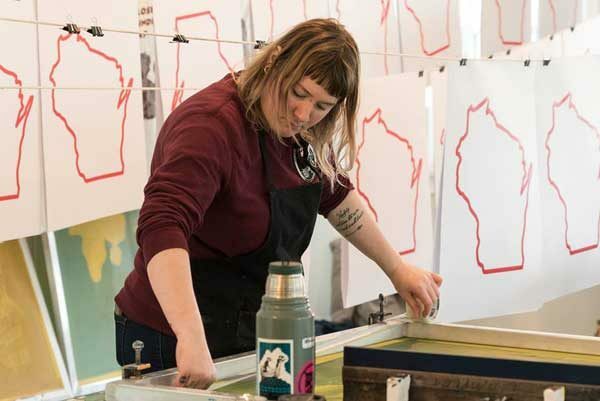 We also rented out a space for the art build and went to our go-to dream space – the large open work space above Company Brewing in the Riverwest neighborhood. 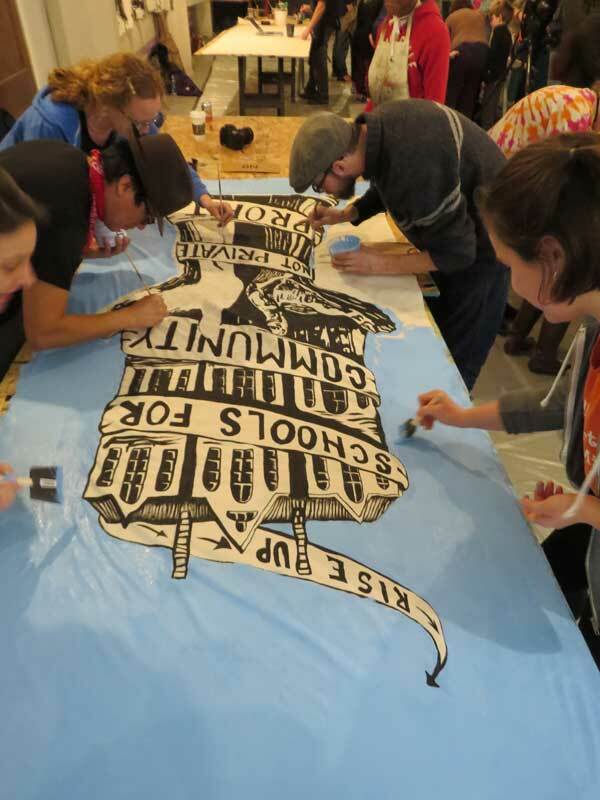 Company Brewing had rented out their space to us prior for the May Day art build in 2016 and we have always admired and appreciated their business and their dedication to the community and to the arts. When the art build weekend approached Joe Brusky and I went into construction mode and began doing material runs and hauling all the materials needed to the art build space. 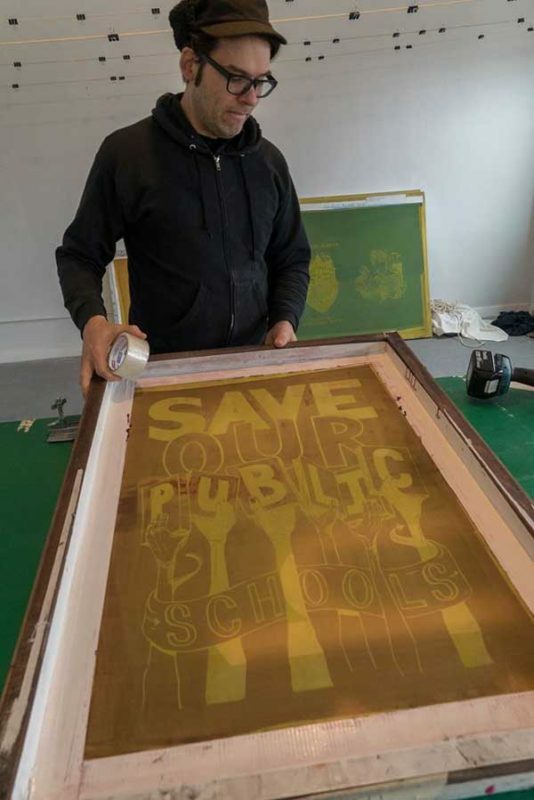 The goal for producing art was ambitious: 600 prints, specifically 200 screen printed signs that would be assembled on poles – the same technique that David Solnit had taught us the year prior, 200 screenprinted posters of one of Sue’s designs that would distributed to the schools, and 200 prints on poster board of the state outlines that students and educators at the art build could add their own message to. 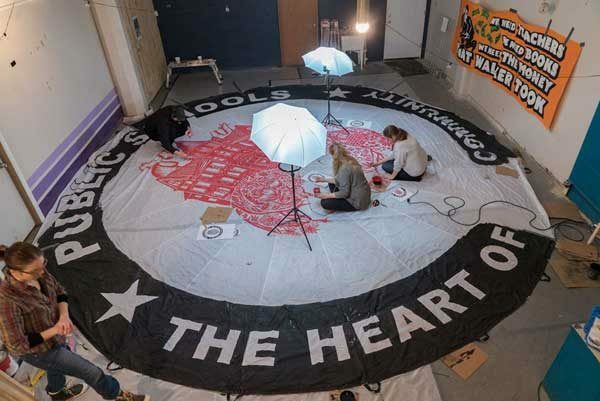 We also set a goal for painting ten banners (each around 4′ x 12′) and two parachute banners that are 24′ in diameter. This to-do list for a two-and-a-half day art build seemed close to impossible to accomplish. Thankfully, Joe Brusky had circulated a google doc and got the word out to all the MTEA members and had four hour shifts of people signed up to take part. And when the art build began we were never short of help. 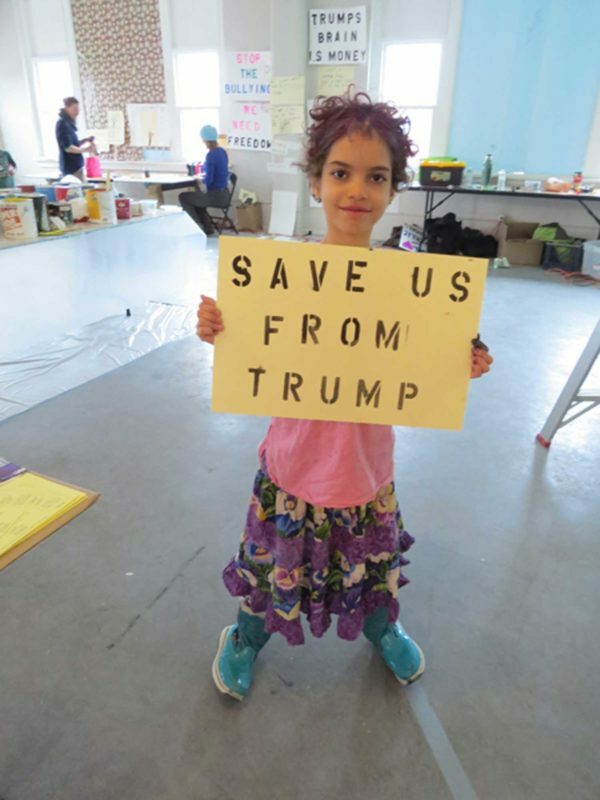 Over 150 people came through the space – many staying for 8-10 hours. It was common for the space to have 40-50 people working at a time. 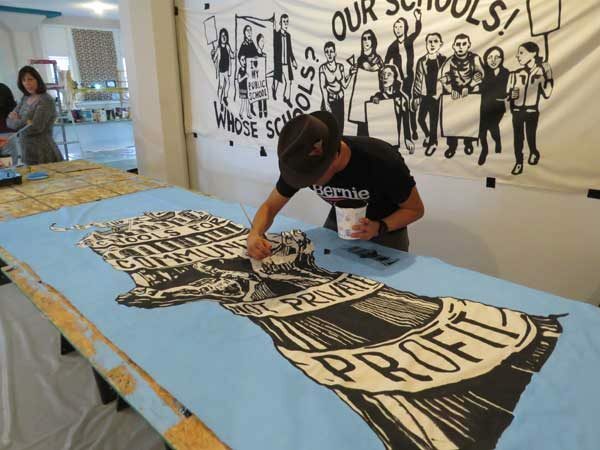 Justseeds artists Paul Kjelland and Pete Railand worked long hours and pulled prints for hours on end, as well as Allison Becker, while teaching others screenprinting skills. 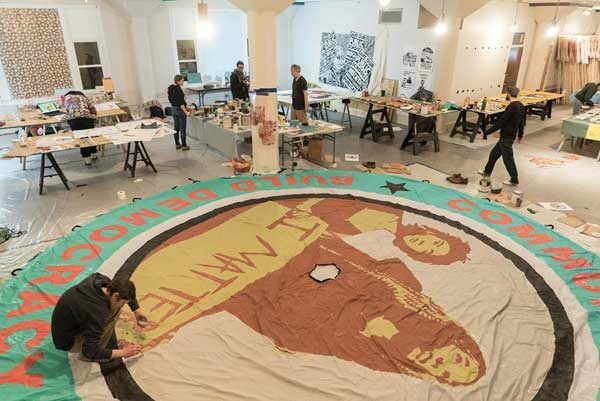 Aaron Hughes of Justseeds and Nicky Baltrushes traveled up from Chicago to help paint the parachute banners on Sunday. 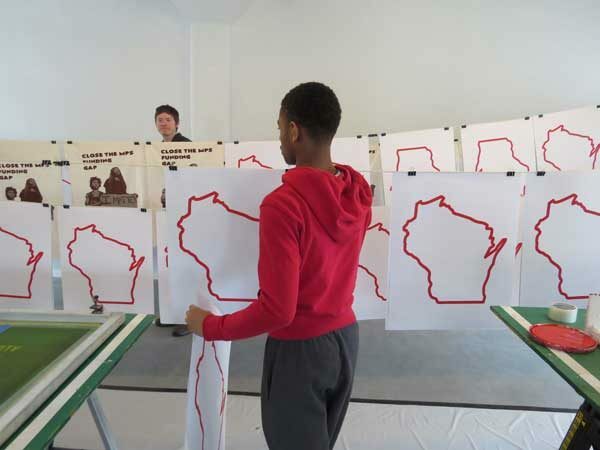 The UWM Art Education department was their in force which is no surprise considering its primary focus on art and social justice. 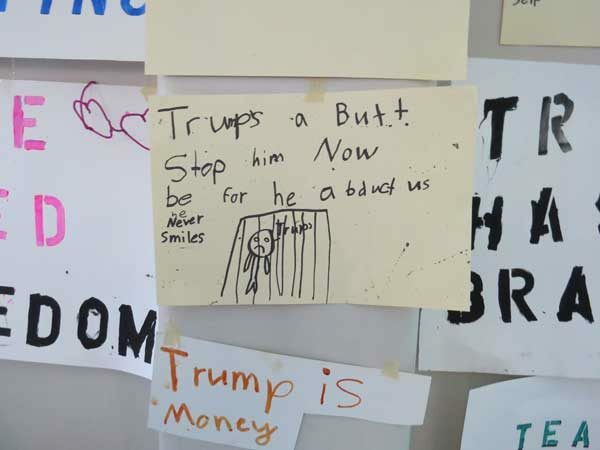 And Laura Klein organized a kids corner at the Art Build so that parents could attend and so that kids could also make their signs. 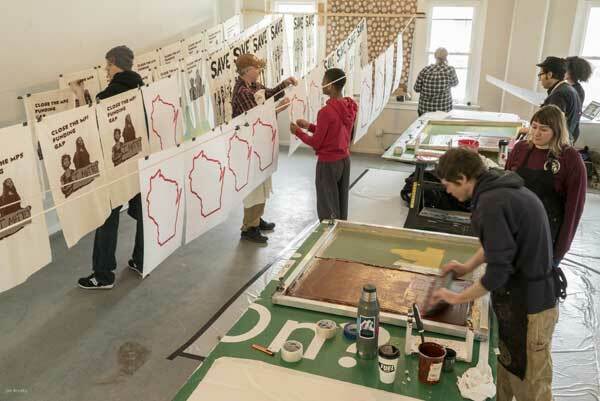 Overall Milwaukee has just become a hub city in the US for activist art. We don’t have an art world here (thankfully.) 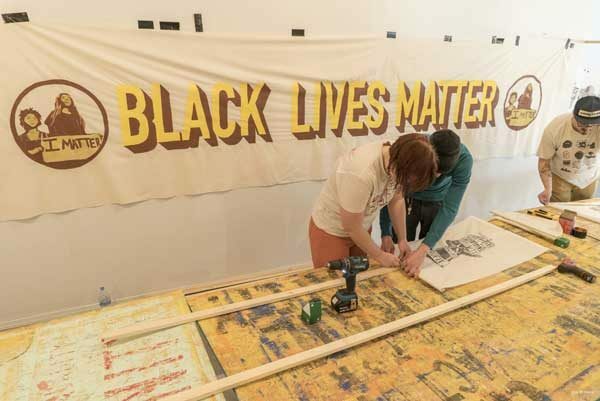 Instead, many of us in Milwaukee have long since dedicated our art practice to working in activist movements and to the needs of the community. 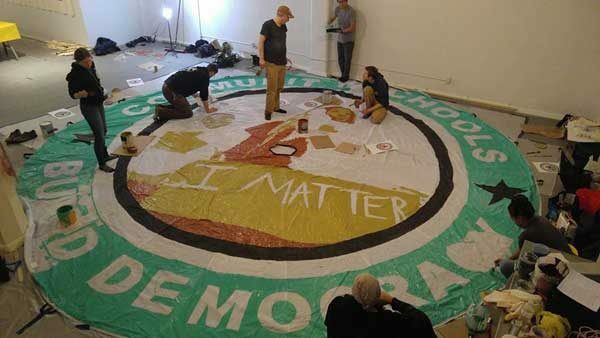 In Milwaukee we have access to large spaces, a thriving DIY scene, and we are well versed (unfortunately) to living under constant attack from the Right, most notably from 2011-on since Walker took office so building diverse coalitions and responding at a moments notice is not new to us. 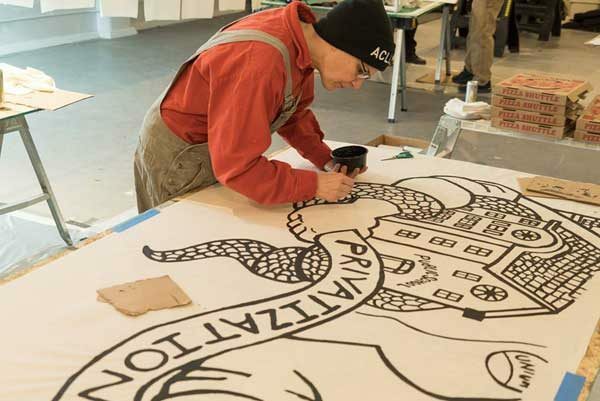 Below are some photos from the two-and-half-day art build and a time-lapse video by Joe Brusky. 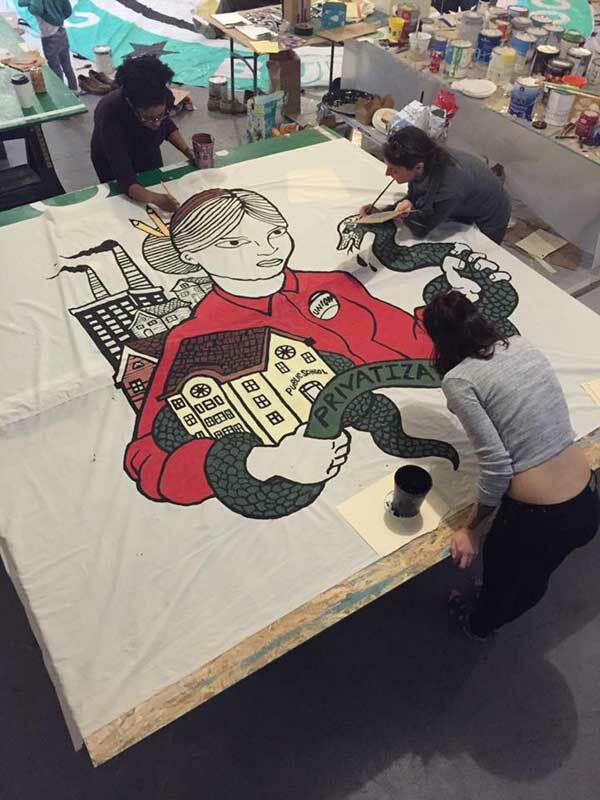 Also a thank you to the organizing team for this art build: MTEA art build coordinator: Joe Brusky. 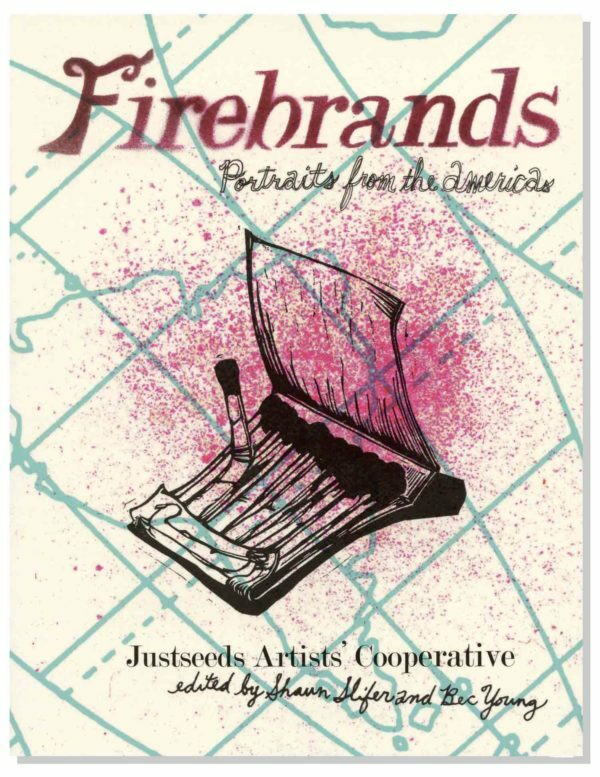 Artist organizers: Nicolas Lampert, Susan Simensky Bietila. MTEA/art teachers: Allyson Craft (Clarke Street), Sue Pezanoski-Brown (Fratney Elementary), John Fleissner (Hamilton High School), Liz Kremer (Brown Street) Gina Jorgensen (North Division High School). Additional organizers: Kim Cosier (UWM), Laura Klein (kid’s corner.) Artists submitting key designs: Pete Railand, Raoul Deal, Jazzica Jazzner, Nicolas Lampert, Susan Simensky Bietila, John Fleissner. Thank you also and always to Company Brewing. Photos by Nicolas Lampert, unless noted. Work already being put into use! 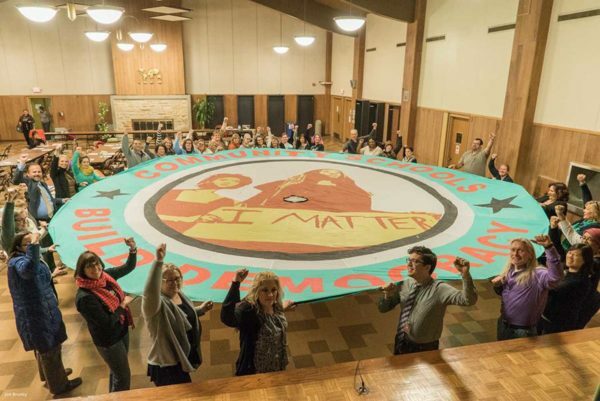 Banner unfurled at the conclusion of the MTEA union leader representative assembly. 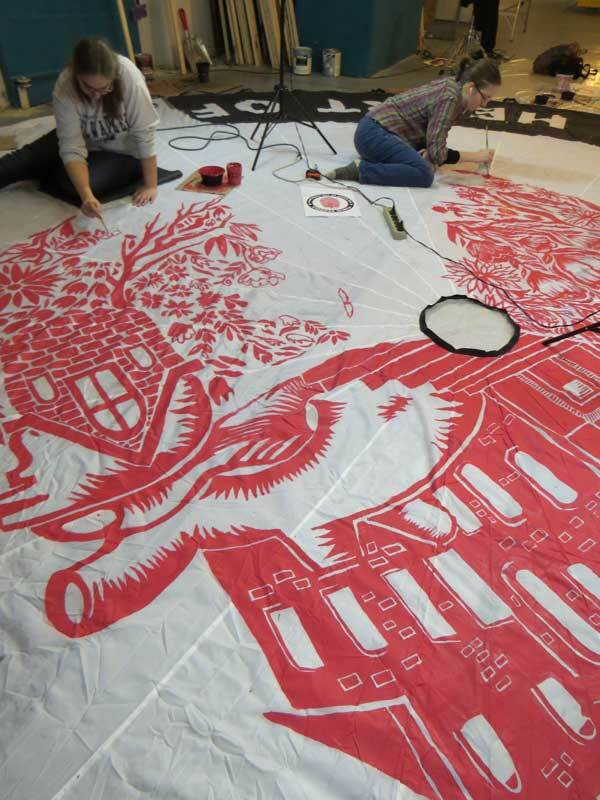 Milwaukee Art Build for Public Education Parachute Timelapse from MTEA Union on Vimeo. 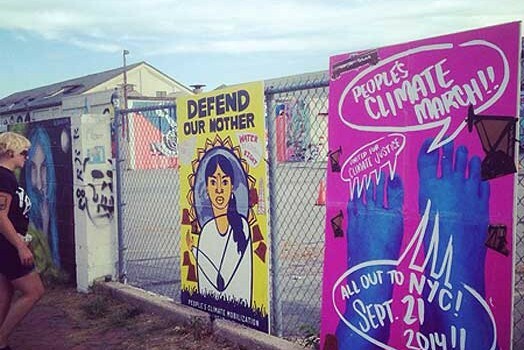 Another reason to protest Obama: His support for nuclear power plants.